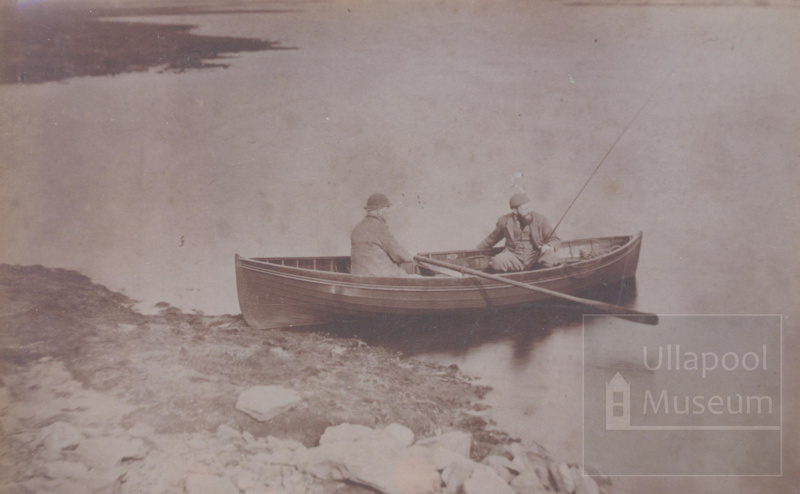 About this object2 men in a rowing boat with fishing rod, fishing on Loch Droma. Loch Droma is beside the Ullapool to Garve road (A835) about 22 kilometres from Ullapool. Presumably the man on the oars is an employee of the estate, and the other would be one of the Fowler family that included Sir John Fowler who designed the original Metropolitan Railway in London (the forerunner to the London underground) and who went on to design and build the Forth Railway Bridge with Benjamin Baker. For many years the Fowlers owned the Braemore Estate which this loch was on. Remains of experimental prototype bridges built by Sir John can still be found in the area.